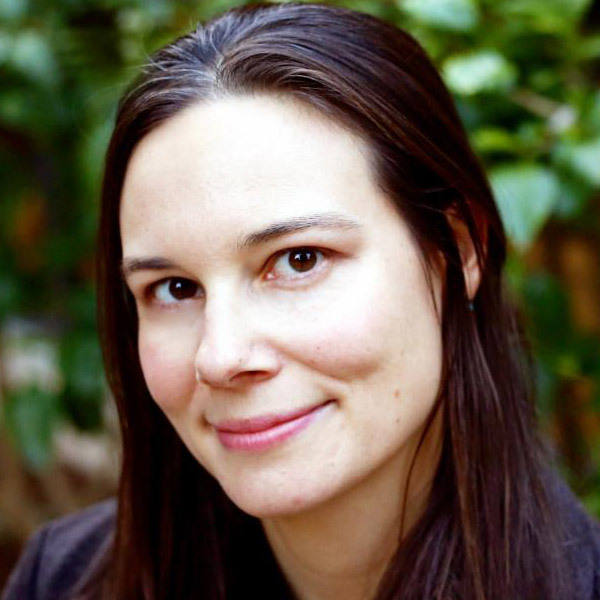 This is a guest post by NNCG member Leah Ersoylu, PhD, President of Ersoylu Consulting, a philanthropic advising firm based in Southern California, focused on the nexus of systems & policy change and evaluation. She and her team are committed to data-driven do-gooding. As philanthropic consultants specializing in systems and policy change, my team and I are in the business of impacting society’s most “wicked problems”. A wicked problem is a social or cultural problem that is perceived as difficult or impossible to solve. Most commonly, this is due to: 1) incomplete or contradictory knowledge, 2) the number of people and opinions involved, 3) large economic burden, and 4) the interconnected nature of these problems with other problems (Kolko, 2012). Despite the complexity of wicked problems, those in philanthropy (read: donors and funders) continue to operate as though piecemeal solutions can have meaningful impact on society’s big problems (Ranghelli, 2012). Research has demonstrated that policy advocacy and civic engagement are among the most effective strategies for foundations seeking to achieve systemic change, helping to truly advance equity (Edwards, 2008; NCRP 2005; Ranghelli, 2009). Despite this, a 2005 analysis of grantmaking trends determined that, overall, foundations had not increased their support for systems change efforts, with only 33% of U.S. foundation grant dollars intentionally targeting systemic issues (Ranghelli, 2012). Systems change is a way to impact root causes – not symptoms – of complex social issues by shifting how decisions are made about policies, programs, resources, and relationships — ultimately, in the way business is done. Given this, why are funders still reluctant to invest in systems change? This is in part a result of lingering urban legends surrounding key systems change investments – advocacy and civic engagement. Fears of the potential complications and a need to reach the ‘low hanging fruit’ are barriers to investing in this type of long term change. In addition, others worry that it is an overly costly solution with many unknown variables that are difficult to measure. Therefore, they are not willing to make “Big Bets”, a la The California Endowment and others (Powell, A., Huang, J., Foster, W ., Boyd, M., & Sakaue, L., 2016). However, those arguments lose steam when we look at the actual numbers. 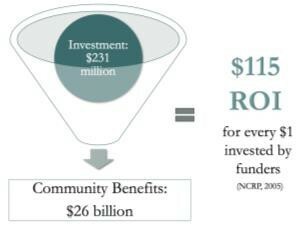 A 2008 study examined the social and economic impact of institutional philanthropy and found that among eight categories of grantmaking (including education, arts, health, human services, and the environment), grants for public affairs/society benefit had the highest ROI (return on investment) at 22 to 1 (Shapiro, R.J. & Mathur, A.,2008). Furthermore, the investment doesn’t have to break the philanthropic bank; researchers have suggested that the philanthropic community in the US could become a key player in policy advocacy by investing $1 billion. Note that, although this figure seems high, it is significantly less than the $30 billion required to make an equivalent impact in direct aid or scientific research fields (IHME 2012, NIH 2017). We are inspired by our work with funders who are growing increasingly dissatisfied with merely dabbling at the margins of pressing issues. Foundations are increasingly leveraging their political capital to advance community change (Auspos, 2015). 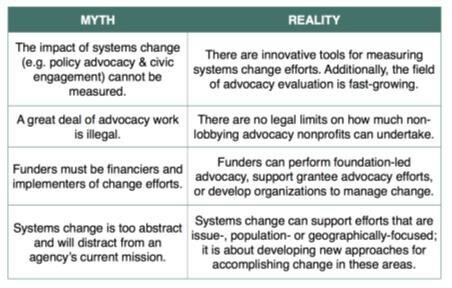 Over the past decade, funder-supported advocacy has gained traction within California, as funders recognize it as a successful avenue to impact the larger system (Margolis, D & Ersoylu, L., 2015). Therefore, foundations have a unique opportunity to position themselves as impact leaders in this growing field. Those funders—and donors—who understand that policy advocacy and civic engagement, in combination with strategies such as coalition building and targeted research, will move beyond ‘tinkering at the margins’ to affect root causes. They will see their investment portfolios become more complex but also more impactful over time. Self-Awareness. Gain clarity on what your organization is and is not comfortable with. Understand what role(s) you want to play in change-making; self-reflection is key. Coordination with other funders is critical; understand where your interest ends and theirs begins to create a continuum of support for the work. Remember, you can’t fund it all. Choose to make distinctive, intentional investments in the landscape either a) where large investments have not yet been made or b) where other investments are ‘on the brink’ of making an impact but may need an extra push. Trust but Verify. Assess and determine whether your potential advocacy grantees have the capacity and long-term interest to engage in this type of work. Beware that some nonprofits will ‘follow the money’ and perhaps commit ‘mission drift’, while others may genuinely want to engage in these advocacy and systems change strategies and will need support while they work to get the right internal supports (staffing, procedures, sustainable funding mix, etc) in place to do so effectively. If needed, explore options for coaching and capacity-building. Measure Impacts. Evaluation of your impact is key. Monitor, learn and grow based on data —not whims and shifting trends. Although these systems change interventions, campaigns and strategies may seem more complex than traditional programmatic funding, there are still rigorous tools and methods that can be applied to support you as you learn and evolve. Edwards, M. (2008). Just another emperor? The myths and realities of philanthrocapitalism. New York: Demos: A Network for Ideas & Action. Institute for Health Metrics and Evaluation. Financing Global Health 2012: The End of the Golden Age? Seattle, WA: IHME, 2012. Powell, A., Huang, J., Foster, W., Boyd, M., & Sakaue, L. (2016). What Ambitious Donors Can Learn From The Atlantic Philanthropies’ Experience Making Big Bets (Rep.). The Bridgespan Group. Ranghelli, L. (2012). Leveraging limited dollars: How grantmakers achieve tangible results by funding policy and community engagement. Available online at https://www.ncrp.org/publications. Shapiro, R.J., & Mathur, A. (2008). The social and economic value of private and community foundations. Washington, DC: Sonecon. Stroh, D.P. (2015). Systems thinking for social change: a practical guide to solving complex problems, avoiding unintended consequences, and achieving lasting results. White River Junction, VT: Chelsea Green Publishing.